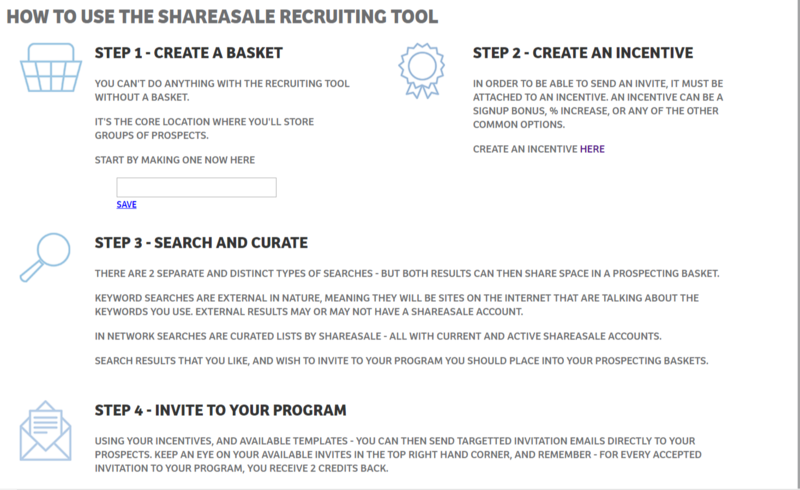 Earlier this month ShareASale opened to public their Recruiting Tool (https://recruiting.shareasale.com/), along with a face lift of the merchant interface. It has been a long wait, but finally ShareASale allows merchants to invite affiliates into their respective programs through the ShareASale merchant interface. They now have a similar tool like CJ Affiliate and Rakuten Affiliate Network. This is great news for merchants as well as affiliates. The new recruiting tool is set up to provide merchants that are exclusive to ShareASale more “affiliate invites” than merchants who have their program on multiple networks. A merchant exclusive to ShareASale is entitled to 30 invites per month, whereas, merchants on multiple networks are entitled to only 20. Also, if a merchant has multiple programs on different networks the affiliate invite list is not allowed to be used on the other networks. Without further ado, let’s get in what this tool looks like and how it works. The layout is easy to understand and maneuver, with each section clearly marked. There are four steps to be completed in order to search for prospective affiliates and send invites. Step 1 – Create a Basket – Merchants should name it something related to the affiliates being targeted. 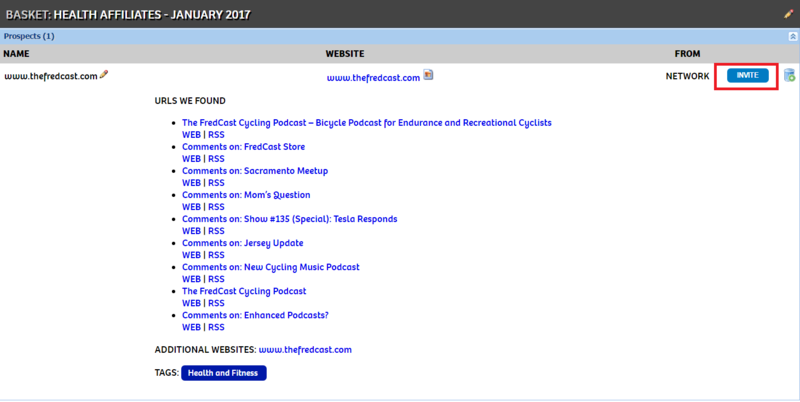 The goal is to be able to distinguish each basket month to month and not be targeting the same affiliates. Step 2 – Create an Incentive – ShareASale requires an incentive to be attached to each invite, recruiting campaigns tend to be more effective if it includes an incentive in some form. Merchants can offer a first sale bonus, a commission increase on “X” amount of sales, etc. Step 3 – Search for Affiliates – There are two ways to search for prospective affiliates (screenshot below), first, a “Keyword Search” and then an “In Network Search”. For the “keyword search” simply type in a phrase in the search box and hit search. ShareASale will look around the internet for blogs that are talking about the keyword used and then provide the results below. Next, the “In Network Search” allows merchants to browse niche categories already provided by ShareASale. Simply click on the category and the results will be placed directly below. What is nice is that the tool sifts out affiliates that are already in the merchant’s program so that an invite is not wasted. Step 4 – Invite Affiliates – This is where the email is created that will be sent out on merchant’s behalf. Make sure the subject line is catchy and the message includes: the prospects name, information about merchant’s business, the program terms (commission, cookies length, etc.) and the incentive. After the invite is complete it will be available directly under the editor so that it can be modified at any time. After all four of the previously mentioned steps are complete merchants can now send invites. Using the search functions described above merchants will create their prospect list and then invite them. The final step to this is inviting affiliates to participate in a merchant’s program. 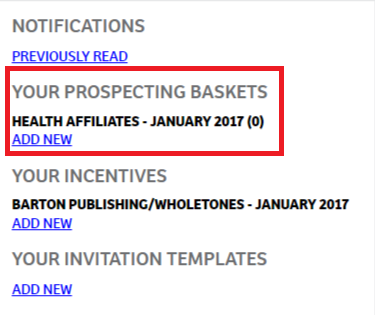 On the right side of the page there will be a group of four sections that include: notifications, prospecting baskets, incentives, and invitation templates. To send the invites click one of the “Prospecting Baskets”. In the prospecting basket will be all the affiliates to be contacted. Simply click the invite button to the right and the invite will be sent directly to the prospective affiliate. Once an affiliate accepts an invitation to join the merchant will receive two credits back to their balance. There you have it ShareASale merchants, an overview of the new recruiting tool. If there are any questions please email me.